(NewsUSA) – What would you do if you learned you had only one year left to live? A new novel from published author Blaize Nolynne explores this question from the perspective of a volunteer fire captain in River Falls, Maine. 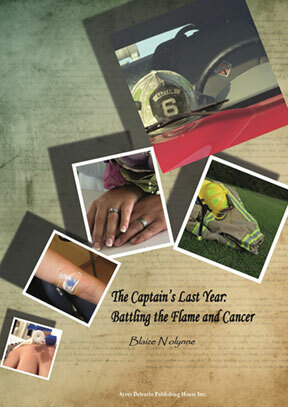 The novel, The Captain’s Last Year, Fighting Fire and Cancer, One Year to Live, depicts the reality of cancer and examines its impact on patients and their families. The story centers on fire captain Steven Williams, whose doctors have given him one year to live after a diagnosis of stage IV stomach cancer. Steven starts with denial, but then he attempts to come to terms with his situation as treatments fail. His thoughts turn to how to make the most of his remaining year, and he grapples with a range of issues. Could he change his relationship with his son, Christopher, or improve the disrespectful attitudes that have become an epidemic in his community? Ms. Nolynne’s intent is to make readers consider what they would do if they learned they had one year left to live. Fire and rescue services are the venues of many of Ms. Nolynne’s books, and she writes from personal experience. In an interview with a local newspaper, The Independent, she notes that her father was a volunteer fire captain with the fire department in Standish, Maine, and that she visited the department often as a child. Her paternal grandfather was a volunteer firefighter and a driver for the local rescue squad, and her great-grandfather served as a fireman in South Portland, Maine. Another family member — Ms. Nolynne’s grandmother — also inspired the novel through her battle with terminal cancer. Ms. Nolynne is honoring her grandmother and the firefighters in her family by assisting with the medical expenses of Jeff Douglass, a fire chief in Baldwin, Maine, who has stage four pancreatic cancer. A portion of the proceeds from sales of The Captain’s Last Year, Fighting Fire and Cancer, One Year to Live will go to Team Jeff, Code 3 for a Cure, in addition to other firefighter cancer charities. Ms. Nolynne’s books are available at amazon.com, barnesandnoble.com and bam.com (Books A Million). For more information about the book, visit www.ayresdelzariopublishinginc.com. How is your brand supporting National Cancer Survivors Day?